Confocal immunofluorescence image of whole-mount staining of the myenteric plexus — a network of nerve fibers located within the layer of muscular tissue that lines the digestive system. This plexus is part of the enteric nervous system, a subdivision of the peripheral nervous system that is responsible for controlling the activities of the digestive tract. 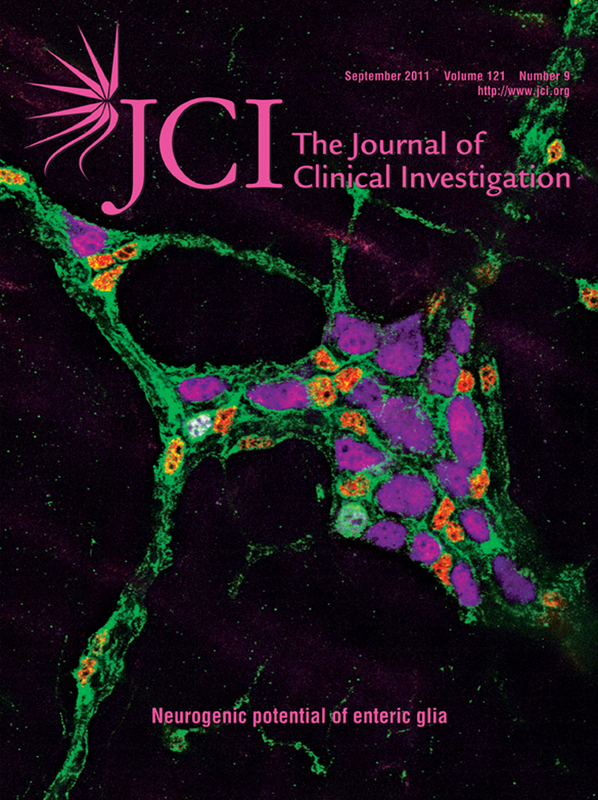 In this issue of the JCI, two studies (pages 3398 and 3412) provide compelling evidence that enteric glia can also be neuronal precursors. Enteric glia were shown to give rise to neurons in vitro, and neurogenesis could be experimentally induced to occur in vivo; however, it was not easily provoked. Citation Information: J Clin Invest. 2011;121(9):3361-3361. https://doi.org/10.1172/JCI60000. Citation Information: J Clin Invest. 2011;121(9):3364-3364. https://doi.org/10.1172/JCI60154. Citation Information: J Clin Invest. 2011;121(9):3365-3365. https://doi.org/10.1172/JCI58960. Citation Information: J Clin Invest. 2011;121(9):3366-3366. https://doi.org/10.1172/JCI58082. Citation Information: J Clin Invest. 2011;121(9):3375-3383. https://doi.org/10.1172/JCI57158. Citation Information: J Clin Invest. 2011;121(9):3384-3386. https://doi.org/10.1172/JCI58297. Prouroguanylin is a gastrointestinal paracrine signal and prohormone that is secreted after nutrient ingestion. In this issue of the JCI, Valentino et al. show that prouroguanylin is converted to uroguanylin in the CNS, which can activate guanylyl cyclase 2C (GUCY2C) receptors in the brain to reduce food intake in mice. This 16–amino acid residue peptide is a novel component of the gut-brain axis that represents a new and unique opportunity to manipulate gut-brain signaling for therapeutic intervention in obesity. Citation Information: J Clin Invest. 2011;121(9):3386-3389. https://doi.org/10.1172/JCI59573. Citation Information: J Clin Invest. 2011;121(9):3389-3392. https://doi.org/10.1172/JCI59219. Parkinson disease (PD) is a relatively common neurodegenerative disorder characterized by the progressive degeneration of dopaminergic neurons in the substantia nigra. About 5%–10% of PD cases are inherited. Mutations in the Parkin gene, which encodes a protein that can function as an E3 ubiquitin ligase, are a common cause of familial PD. Such mutations act in a loss-of-function manner and impair the ability of the encoded protein to mediate substrate ubiquitination, although the subsequent molecular pathway that precipitates neuronal degeneration is poorly defined. In this issue of the JCI, Kim and colleagues describe painstaking evidence using a number of dissecting approaches in intact animals and cultured cells to functionally link Parkin and the class B scavenger receptor CD36, suggesting a novel and complex connection between PD and fatty acid metabolism. Citation Information: J Clin Invest. 2011;121(9):3398-3411. https://doi.org/10.1172/JCI58186. Citation Information: J Clin Invest. 2011;121(9):3412-3424. https://doi.org/10.1172/JCI58200. Citation Information: J Clin Invest. 2011;121(9):3442-3455. https://doi.org/10.1172/JCI45390. Citation Information: J Clin Invest. 2011;121(9):3517-3527. https://doi.org/10.1172/JCI46387. The immune and coagulation systems are both implicated in the pathogenesis of rheumatoid arthritis (RA). Plasma carboxypeptidase B (CPB), which is activated by the thrombin/thrombomodulin complex, plays a procoagulant role during fibrin clot formation. However, an antiinflammatory role for CPB is suggested by the recent observation that CPB can cleave proinflammatory mediators, such as C5a, bradykinin, and osteopontin. Here, we show that CPB plays a central role in downregulating C5a-mediated inflammatory responses in autoimmune arthritis. CPB deficiency exacerbated inflammatory arthritis in a mouse model of RA, and cleavage of C5a by CPB suppressed the ability of C5a to recruit immune cells in vivo. In human patients with RA, genotyping of nonsynonymous SNPs in the CPB-encoding gene revealed that the allele encoding a CPB variant with longer half-life was associated with a lower risk of developing radiographically severe RA. Functionally, this CPB variant was more effective at abrogating the proinflammatory properties of C5a. Additionally, expression of both CPB and C5a in synovial fluid was higher in patients with RA than in those with osteoarthritis. These findings suggest that CPB plays a critical role in dampening local, C5a-mediated inflammation and represents a molecular link between inflammation and coagulation in autoimmune arthritis. Citation Information: J Clin Invest. 2011;121(9):3528-3541. https://doi.org/10.1172/JCI45557. The drug development process for CNS indications is hampered by a paucity of preclinical tests that accurately predict drug efficacy in humans. Here, we show that a wide variety of CNS-active drugs induce characteristic alterations in visual stimulus–induced and/or spontaneous eye movements in mice. Active compounds included sedatives and antipsychotic, antidepressant, and antiseizure drugs as well as drugs of abuse, such as cocaine, morphine, and phencyclidine. The use of quantitative eye-movement analysis was demonstrated by comparing it with the commonly used rotarod test of motor coordination and by using eye movements to monitor pharmacokinetics, blood-brain barrier penetration, drug-receptor interactions, heavy metal toxicity, pharmacologic treatment in a model of schizophrenia, and degenerative CNS disease. We conclude that eye-movement analysis could complement existing animal tests to improve preclinical drug development. Citation Information: J Clin Invest. 2011;121(9):3598-3608. https://doi.org/10.1172/JCI58056. The worldwide prevalence of type 2 diabetes (T2D), which is caused by a combination of environmental and genetic factors, is increasing. With regard to genetic factors, variations in the gene encoding Cdk5 regulatory associated protein 1–like 1 (Cdkal1) have been associated with an impaired insulin response and increased risk of T2D across different ethnic populations, but the molecular function of this protein has not been characterized. Here, we show that Cdkal1 is a mammalian methylthiotransferase that biosynthesizes 2-methylthio-N6-threonylcarbamoyladenosine (ms2t6A) in tRNALys(UUU) and that it is required for the accurate translation of AAA and AAG codons. Mice with pancreatic β cell–specific KO of Cdkal1 (referred to herein as β cell KO mice) showed pancreatic islet hypertrophy, a decrease in insulin secretion, and impaired blood glucose control. In Cdkal1-deficient β cells, misreading of Lys codon in proinsulin occurred, resulting in a reduction of glucose-stimulated proinsulin synthesis. Moreover, expression of ER stress–related genes was upregulated in these cells, and abnormally structured ER was observed. Further, the β cell KO mice were hypersensitive to high fat diet–induced ER stress. These findings suggest that glucose-stimulated translation of proinsulin may require fully modified tRNALys(UUU), which could potentially explain the molecular pathogenesis of T2D in patients carrying cdkal1 risk alleles. Citation Information: J Clin Invest. 2011;121(9):3623-3634. https://doi.org/10.1172/JCI46323. Citation Information: J Clin Invest. 2011;121(9):3645-3656. https://doi.org/10.1172/JCI46274. T cell Ig domain and mucin domain protein 1 (TIM-1) is a costimulatory molecule that regulates immune responses by modulating CD4+ T cell effector differentiation. However, the function of TIM-1 on other immune cell populations is unknown. Here, we show that in vivo in mice, TIM-1 is predominantly expressed on B rather than T cells. Importantly, TIM-1 was expressed by a large majority of IL-10–expressing regulatory B cells in all major B cell subpopulations, including transitional, marginal zone, and follicular B cells, as well as the B cell population characterized as CD1dhiCD5+. A low-affinity TIM-1–specific antibody that normally promotes tolerance in mice, actually accelerated (T cell–mediated) immune responsiveness in the absence of B cells. TIM-1+ B cells were highly enriched for IL-4 and IL-10 expression, promoted Th2 responses, and could directly transfer allograft tolerance. Both cytokine expression and number of TIM-1+ regulatory B cells (Bregs) were induced by TIM-1–specific antibody, and this was dependent on IL-4 signaling. Thus, TIM-1 is an inclusive marker for IL-10+ Bregs that can be induced by TIM-1 ligation. These findings suggest that TIM-1 may be a novel therapeutic target for modulating the immune response and provide insight into the signals involved in the generation and induction of Bregs. Citation Information: J Clin Invest. 2011;121(9):3666-3676. https://doi.org/10.1172/JCI57761. Streptococcus pneumoniae colonizes the mucosal surface of the human upper respiratory tract. A colonization event is gradually cleared through phagocytosis by monocytes/macrophages that are recruited to the airway lumen. Here, we sought to define the bacterial and host factors that promote monocyte/macrophage influx and S. pneumoniae clearance using intranasal bacterial challenge in mice. We found that the recruitment of monocytes/macrophages required their expression of the chemokine receptor CCR2 and correlated with expression of the CCR2 ligand CCL2. Production of CCL2 and monocyte/macrophage recruitment were deficient in mice lacking digestion of peptidoglycan by lysozyme (LysM) and cytosolic sensing of the products of digestion by Nod2. Ex vivo macrophages produced CCL2 following bacterial uptake, digestion by LysM, and sensing of peptidoglycan by Nod2. Sensing of digested peptidoglycan by Nod2 also required the pore-forming toxin pneumolysin. The generation of an adaptive immune response, as measured by anti-pneumococcal antibody titers, was also LysM- and Nod2-dependent. Together, our data suggest that bacterial uptake by professional phagocytes is followed by LysM-mediated digestion of S. pneumoniae–derived peptidoglycan, sensing of the resulting products by Nod2, release of the chemokine CCL2, and CCR2-dependent recruitment of the additional monocytes/macrophages required for the clearance of an S. pneumoniae colonization event. Citation Information: J Clin Invest. 2011;121(9):3677-3688. https://doi.org/10.1172/JCI57379. Citation Information: J Clin Invest. 2011;121(9):3689-3700. https://doi.org/10.1172/JCI45709. Citation Information: J Clin Invest. 2011;121(9):3701-3712. https://doi.org/10.1172/JCI44736. It has long been hypothesized that abnormalities in lipid biology contribute to degenerative brain diseases. Consistent with this, emerging epidemiologic evidence links lipid alterations with Parkinson disease (PD), and disruption of lipid metabolism has been found to predispose to α-synuclein toxicity. We therefore investigated whether Parkin, an E3 ubiquitin ligase found to be defective in patients with early onset PD, regulates systemic lipid metabolism. We perturbed lipid levels by exposing Parkin+/+ and Parkin–/– mice to a high-fat and -cholesterol diet (HFD). Parkin–/– mice resisted weight gain, steatohepatitis, and insulin resistance. In wild-type mice, the HFD markedly increased hepatic Parkin levels in parallel with lipid transport proteins, including CD36, Sr-B1, and FABP. These lipid transport proteins were not induced in Parkin–/– mice. The role of Parkin in fat uptake was confirmed by increased oleate accumulation in hepatocytes overexpressing Parkin and decreased uptake in Parkin–/– mouse embryonic fibroblasts and patient cells harboring complex heterozygous mutations in the Parkin-encoding gene PARK2. Parkin conferred this effect, in part, via ubiquitin-mediated stabilization of the lipid transporter CD36. Reconstitution of Parkin restored hepatic fat uptake and CD36 levels in Parkin–/– mice, and Parkin augmented fat accumulation during adipocyte differentiation. These results demonstrate that Parkin is regulated in a lipid-dependent manner and modulates systemic fat uptake via ubiquitin ligase–dependent effects. Whether this metabolic regulation contributes to premature Parkinsonism warrants investigation. Citation Information: J Clin Invest. 2011;121(9):3713-3723. https://doi.org/10.1172/JCI45472. In rodents, acute brain insulin action reduces blood glucose levels by suppressing the expression of enzymes in the hepatic gluconeogenic pathway, thereby reducing gluconeogenesis and endogenous glucose production (EGP). Whether a similar mechanism is functional in large animals, including humans, is unknown. Here, we demonstrated that in canines, physiologic brain hyperinsulinemia brought about by infusion of insulin into the head arteries (during a pancreatic clamp to maintain basal hepatic insulin and glucagon levels) activated hypothalamic Akt, altered STAT3 signaling in the liver, and suppressed hepatic gluconeogenic gene expression without altering EGP or gluconeogenesis. Rather, brain hyperinsulinemia slowly caused a modest reduction in net hepatic glucose output (NHGO) that was attributable to increased net hepatic glucose uptake and glycogen synthesis. This was associated with decreased levels of glycogen synthase kinase 3β (GSK3β) protein and mRNA and with decreased glycogen synthase phosphorylation, changes that were blocked by hypothalamic PI3K inhibition. Therefore, we conclude that the canine brain senses physiologic elevations in plasma insulin, and that this in turn regulates genetic events in the liver. In the context of basal insulin and glucagon levels at the liver, this input augments hepatic glucose uptake and glycogen synthesis, reducing NHGO without altering EGP. Citation Information: J Clin Invest. 2011;121(9):3724-3734. https://doi.org/10.1172/JCI45277. High plasma concentrations of lipoprotein(a) [Lp(a), which is encoded by the APOA gene] increase an individual’s risk of developing diseases, such as coronary artery diseases, restenosis, and stroke. Unfortunately, increased Lp(a) levels are minimally influenced by dietary changes or drug treatment. Further, the development of Lp(a)-specific medications has been hampered by limited knowledge of Lp(a) metabolism. In this study, we identified patients suffering from biliary obstructions with very low plasma Lp(a) concentrations that rise substantially after surgical intervention. Consistent with this, common bile duct ligation in mice transgenic for human APOA (tg-APOA mice) lowered plasma concentrations and hepatic expression of APOA. To test whether farnesoid X receptor (FXR), which is activated by bile acids, was responsible for the low plasma Lp(a) levels in cholestatic patients and mice, we treated tg-APOA and tg-APOA/Fxr–/– mice with cholic acid. FXR activation markedly reduced plasma concentrations and hepatic expression of human APOA in tg-APOA mice but not in tg-APOA/Fxr–/– mice. Incubation of primary hepatocytes from tg-APOA mice with bile acids dose dependently downregulated APOA expression. Further analysis determined that the direct repeat 1 element between nucleotides –826 and –814 of the APOA promoter functioned as a negative FXR response element. This motif is also bound by hepatocyte nuclear factor 4α (HNF4α), which promotes APOA transcription, and FXR was shown to compete with HNF4α for binding to this motif. These findings may have important implications in the development of Lp(a)-lowering medications. Citation Information: J Clin Invest. 2011;121(9):3735-3746. https://doi.org/10.1172/JCI43382. Reduced bone morphogenetic protein receptor 2 (BMPR2) expression in patients with pulmonary arterial hypertension (PAH) can impair pulmonary arterial EC (PAEC) function. This can adversely affect EC survival and promote SMC proliferation. We hypothesized that interventions to normalize expression of genes that are targets of BMPR2 signaling could restore PAEC function and prevent or reverse PAH. Here we have characterized, in human PAECs, a BMPR2-mediated transcriptional complex between PPARγ and β-catenin and shown that disruption of this complex impaired BMP-mediated PAEC survival. Using whole genome-wide ChIP-Chip promoter analysis and gene expression microarrays, we delineated PPARγ/β-catenin–dependent transcription of target genes including APLN, which encodes apelin. We documented reduced PAEC expression of apelin in PAH patients versus controls. In cell culture experiments, we showed that apelin-deficient PAECs were prone to apoptosis and promoted pulmonary arterial SMC (PASMC) proliferation. Conversely, we established that apelin, like BMPR2 ligands, suppressed proliferation and induced apoptosis of PASMCs. Consistent with these functions, administration of apelin reversed PAH in mice with reduced production of apelin resulting from deletion of PPARγ in ECs. Taken together, our findings suggest that apelin could be effective in treating PAH by rescuing BMPR2 and PAEC dysfunction. Citation Information: J Clin Invest. 2011;121(9):3747-3755. https://doi.org/10.1172/JCI44778. Citation Information: J Clin Invest. 2011;121(9):3763-3763. https://doi.org/10.1172/JCI60364.